OSHA Safety Initiative Announced | "Grain Handling"
OSHA Announces New Safety Initiative Entitled “Grain Handling”. Perhaps in part as a result of a series on grain bin entrapment deaths entitled Buried in Grain, a joint effort of NPR and the Center for Public Integrity was published in March of this year, OSHA has announced a new safety initiative in several states to promote safe practices in the grain industry. OSHA says that it entered into an alliance with the Wisconsin Agri-Business Association to focus on projects to educate employers on safety in grain handling in 2012. OSHA has now also partnered with the Professional Dairy Producers of Wisconsin and the University of Wisconsin Extension’s Agricultural Safety Specialist to further promote awareness of safety issues in grain handling by including information on their websites and in newsletters. Additionally, OSHA has provided information on their website on topics related to hazards in the handling of grain and their prevention. In cooperation with the Illinois Grain Handling Safety Coalition and the Grain and Feed Association of Illinois, OSHA has also created a decal resembling a stop sign which alerts workers to the hazards to avoid and which can be placed on doors at the worksite to remind employees of these safety issues. OSHA is promoting this initiative in six states – Illinois, Ohio, Wisconsin, Kansas, Missouri, and Nebraska. Since 1984, there have been 179 grain entrapment deaths. Over the last 50 years, there have been 900 incidents of grain engulfment with 62 percent of those resulting in fatalities. Without proper precautions and procedures being followed, workers entering grain bins can be engulfed and suffocated in seconds. 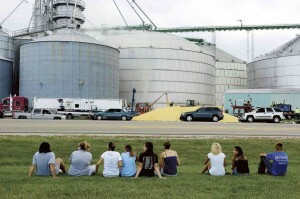 In some instances grain collapses on workers unexpectedly. In others the grain begins moving for various reasons, the results being the same as when someone walks into quicksand. Although, in some serious cases, employers have been assessed large fines for willful violations, the fines are almost always ultimately reduced by up to 60 percent and criminal charges are rarely filed. Due the lack of serious consequences, employers often do not take the measures needed to correct their violations and continue with the same dangerous practices. Often teenagers and even sometimes underage workers are hired and sent into grain bins without any training or protective equipment and procedures followed. Another serious hazard in the grain industry is the possibility of explosions caused by combustible dust. More than 180 people have been killed as the result of such explosions over the past 35 years, and 675 people injured. Other hazards in grain handling include falls, entanglement in or amputation by mechanical equipment, and toxic gases produced either by fumigation or spoiled grain. In addition to general industry standards such as those which apply to confined space entry, OSHA standard 29 CFR 1910.272 covers hazards in grain handling facilities. By following procedures set forth in the OSHA standards, injuries and deaths in the grain industry can be reduced. The new initiative by OSHA and grain industry-related organizations will focus on educating both employers and their employees on these standards and safe practices in grain handling which will save lives of workers in the industry.